My 25 yr old son has been using for probably 3-5 yrs. Heroin has been his drug of choice. He has been living with my ex wife since we divorced when he was about nine years old. I have tried to be a good father, however, I can admit I have made some mistakes along the way. After being in and out of facilities for addiction, he finally hit a wall pretty hard. Due to his stealing, lying, and heroin use I would not give him any money or allow him to stay in my home. Since then he has been in another facility and working(so he says). The problem I am having is that he does not really want to talk to me, and he does not really want to see me. I have been trying, and trying to get with him. It is heartbreaking, and stressful. I love my son to death, I feel like he is blaming me for this problem of his. He was not allowed to stay with me because I have three step children and a wife in the home. That was extremely hard for me and my wife to enforce. I often wonder if I made the right choices. I feel like I have been a lousy father. I am feeling extremely guilty and sick about it. Can you give me some input or advice? I have been really trying to reach out to him, and see him. He is really avoiding me. I have not seen him in months. I don't know what to do or what to say. All I know is that I feel terrible all the time. And of course I really miss my son. What is a parent to do in this situation? He wont even give me an address where he's staying. Oh, and by the way, it's a person's home who is supposedly helping drug addicts and helping them to be structured. It's not a rehab facility per say. I am lost, and sick about it all. Please give me some insight . Thanks for your time, I appreciate it. It is often said that addiction is a family disease and this is certainly true in your case. The entire family has been wounded by your son's addiction and the entire family needs support. I would recommend that you and your wife begin attending Al-anon meetings and working the 12 steps. The 12 steps teach us to understand what we are responsible for and what we are not responsible for. As parents, we all make mistakes and it's important to be accountable and to make amends for the mistakes we've made. But our children are also accountable for the choices they make as well. An addict often uses anger and resentment to control others and to avoid being accountable for their own bad choices. Ideally, once you begin attending Al-anon regularly and get a sponsor who has walked where you're walking, you could convince your son to begin working the 12 steps. Mistreating and unfairly blaming you feeds his addiction and makes it more likely he will relapse. If he would truly begin working the steps he would hopefully gain insight into his relationship with you and have less anger and resentment and more forgiveness. This will free him up to feel many more positive emotions and help him feel better and less of a need to use. The steps help each of us to understand what is on our side of the tracks and also help us do the maintenance necessary to keep our side clean and processing well. The statistics show that if the entire family including the addict works the steps the chances of the addict staying in recovery increase significantly. You can also consider family counseling and trying to get your son to go with you and your wife to mend some of the wounds you both are feeling. 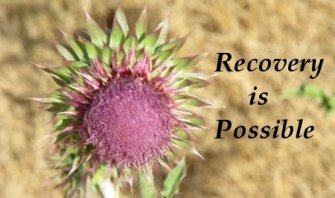 Addiction recovery is a slow process where trust is regained based on right choices. Hopefully, your son can learn this and move forward with your relationship ending the bitterness and resentment and truly ending his addiction.